This product is only eligible for standard UK delivery. 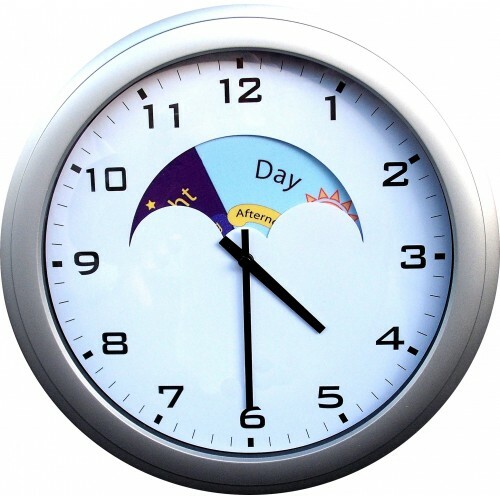 We designed the Round Day/Night clock after a conversation with Henry Simmons of Alzheimer’s Scotland to help those living with Dementia/Alzheimer’s easily orientate themselves with the time of day. The issue is the person has no “depth of time” caused by short term memory issue. While we can remember we did several things, look at the time and think ‘is it only..’ or ‘is that the time already’ the person with Dementia can’t. Our very legible analogue clock is complete with with day/night illustrations that rotates in with the hour hand. The clock displays a Sun picture for daytime and Moon picture for night time. The Sun picture is complete with easy to read ‘Day’ heading and subheadings of ‘Morning’ and ‘Afternoon’. While the moon illustration is complete with ‘Night’ heading and ‘Evening’ and ‘Night’ subheadings. These additional features provide absolute accuracy in orientating the exact time of day without crowding the clock with too much information that could be overwhelming or confusing for the user. Our research also highlighted how essential it was to clearly distinguish the the minute hand and hour hand as 12.20 and 4.00 are ofter confused with one another if they are too similar. Thus hour hands is much broader as well as shorter than the minute hand. This tried and tested clock is ideal for individuals living with Dementia living in there own homes/Hospitals/Care Homes. 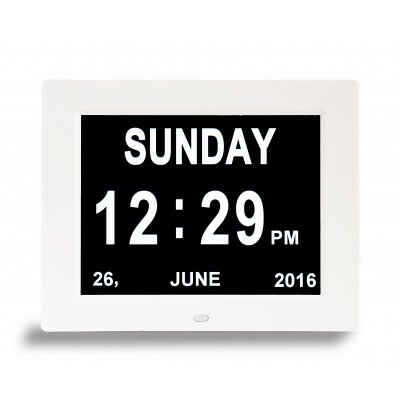 It is also and ideal for public/waiting areas or any area where a bright and easy to read clock is needed. Clairmont is a highly reliable and UK trusted company which has done the research and won the Design Award from DSDC Stirling in 2009, be careful there are similar products out there copied from our original idea. Clock Diameter 310mm. Bright and clear clock face with silver surround. This very legible analogue clock is complete with with day/night illustrations that rotates in with the hour hand. The clock displays a Sun picture for daytime and Moon picture for night time. The Sun picture is complete with easy to read ‘Day’ heading and subheadings of ‘Morning’ and ‘Afternoon’. While the moon illustration is complete with ‘Night’ heading and ‘Evening’ and ‘Night’ subheadings. These additional features provide absolute accuracy in orientating the exact time of day without crowding the clock with too much information that could be overwhelming or confusing for the user. Provides absolute accuracy in orientating the exact time of day. Ideal for individuals living with Dementia living in their own homes and also ideal for public/ waiting areas.